The lands of Valskyrr and Naar are teetering on the brink of destruction! The nefarious Mists have spawned a new threat: powerful Lieutenants that will test the mettle of even the most powerful Heroes. But there is still hope. As new Allies step up to aid the defenders of humanity, and even more items and artefacts become available to use against the Mists, the battle is far from being lost! 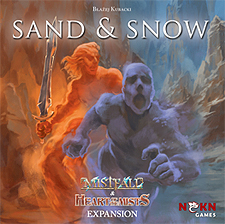 Sand and Snow expands both Mistfall and Heart of the Mists, adding more Allies and Gear, as well as two new types of cards: a new and powerful Enemy type known as the Lieutenant, and Event cards which make the game more difficult, but also more rewarding. This is not a stand-alone expansion, either Mistfall, or Heart of the Mists is required to play.